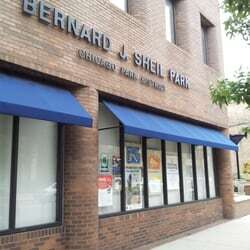 Location: 3505 N. Southport Ave.
Sheil Community Center honors the memory of Archbishop Bernard J. Sheil (1886-1969), pastor at Lake View’s St. Andrew’s Catholic Church for more than three decades. A supporter of ecumenical efforts and of the rights of racial minorities and laborers, Archbishop Sheil was often referred to as “the friend of the little guy.” His interest in young people led him to found the Catholic Youth Organization in 1930. Sheil Community Center is located in the heavily-populated Lake View neighborhood, on land once occupied by the Hanson Laundry Company. 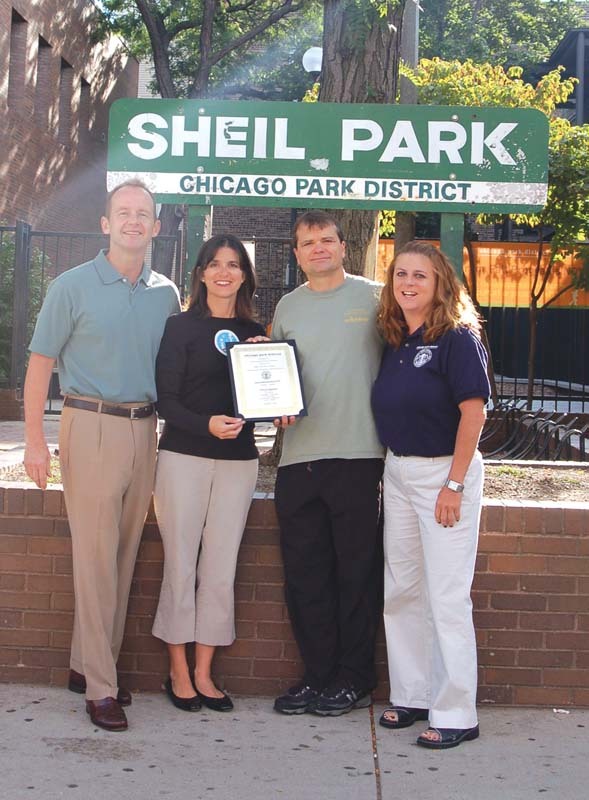 The Chicago Park District purchased the property in 1973, demolishing the laundry plant shortly thereafter. In 1975, the park district broke ground for a field house with a gymnasium, a craft shop, and clubrooms. The gymnasium is named for William E. Pollack (1909-1968), a member of the Illinois House of Representatives from the 13th District, in which the park lies. A native Chicagoan and a graduate of Lake View High School, Pollack served as the Republican leader for six of his nine terms in office. Try new things and take a chance on challenging yourself. Outdoor spaces, new adventures, team building and more will make up your camper’s day. It won’t be routine, but it will be fun! Be creative all summer. Campers will have the opportunity to draw, paint, sing, dance, write poetry and much more. Field trips and special events will all revolve around the arts. Gym facility is available for open play of basketball games. No officials or pre-set teams. 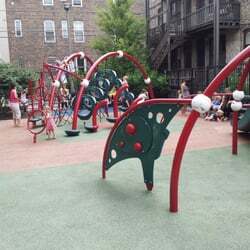 Patrons are welcome to participate at an open level of play. A military-style workout incorporating calisthenics and drills to improve cardiovascular endurance, strength, agility, speed and balance. Mom, Pop & Tot Yoga will focus on the beginning poses of yoga with little ones. The remainder of the class will be designed for free play to help encourage social independence. Involves children working on developmental and coordination skills with Mom & Dad. Play Camp is day camp with age-appropriate recreation for preschool age children. Participants learn early sports skills and enjoy basic art activities in a shorter day packed with summer fun. A club ideal for those interested in socializing with friends and neighbors. Come out and enjoy quality time in group participation activities such as bingo, card playing, board games and more. This Summer, take the stage and be a star. Theater camp teaches all aspects of the performing art. Have fun working with fellow campers to create a show and an ensemble. A final performance will be part of the summer fun. Toddler Camp is an interactive time for toddlers, accompanied by a parent or guardian. Park staff members lead the group in arts and crafts, music and movement, sports, bubbles and water fun, primarily outdoors. This class works to lengthen, strengthen and stretch the body while clearing the mind. Reduce stress while improving strength and flexibility through visualization, focused breathing, and yoga postures?with modifications for all levels.